Elevated between 5577 ft and 7546 ft, the Ski Resort is among the 5 highest elevated Ski Resorts in Carinthia. The vertical drop from summit to base is 1969 ft. The average difference in altitude between base and summit of Ski Resorts in Austria is 2388 ft. The day pass at Heidi-Alm Skipark - Falkert is €28 making it one of the 3 cheapest ski Resorts in Carinthia. 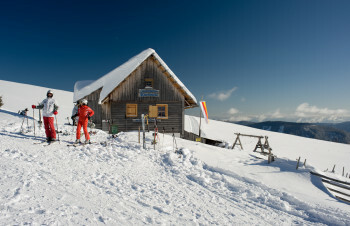 Heidi-Alm Skipark - Falkert is among the 10 best rated Ski Resorts in Carinthia. 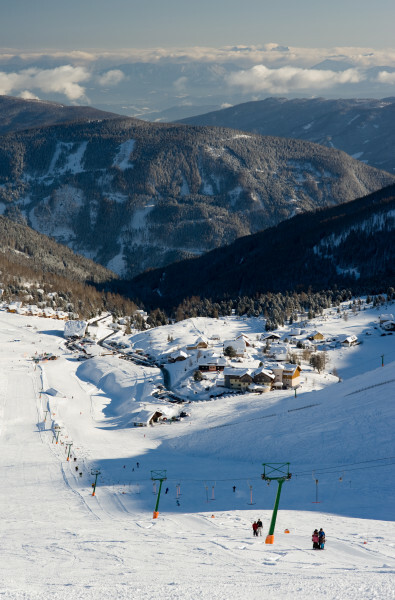 It is among the 3 most family-friendly ski Resorts in Carinthia. Season starts on Dec 15 and ends on Mar 31 (106 days). Average season duration in Austria is 114 days. Average snow depth during the season (Dec 15 to Mar 31) is 48 " at summit elevation and 29 " at base elevation. Snow coverage is usually best during March, offering an average snow depth of 59 " at summit elevation and 34 " at the base. Therefore Heidi-Alm Skipark - Falkert is among the 5 ski Resorts with best snow conditions in Carinthia. Heidi-Alm Skipark - Falkert features 49 sunny days on average per season. The average for all ski Resorts in Austria is 47 sunny days. February is the sunniest month with an average of 19 sunny days. Heidi Alm Skipark is located in the heart of the Nock Mountains, flanking the Heidi Alm BergResort am Falkert. Skiers can look forward to 12 kilometres of immaculately groomed Alpine ski runs here. The compact and stress-free trail network is geared up to cater for skiers of all abilities. Beginners and people re-entering the sport will particularly enjoy the 3 kilometres of blue runs, while there are some 8 kilometres of intermediate trails for more advanced skiers to explore. 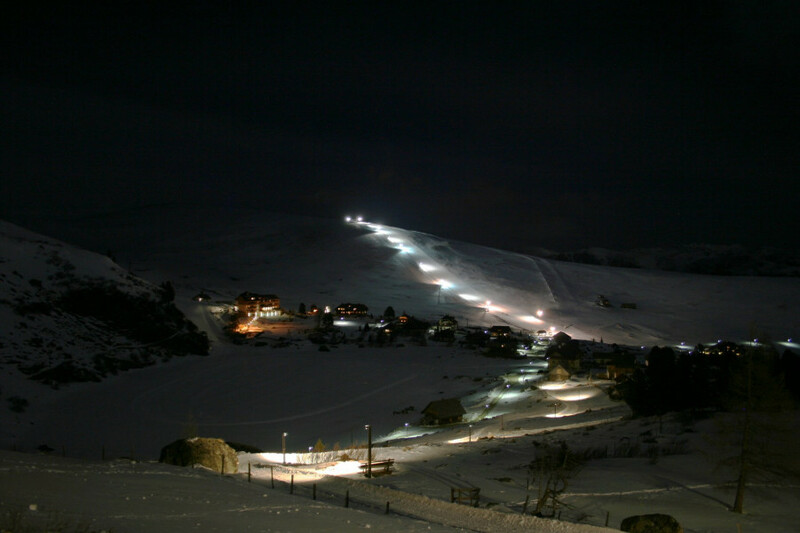 Experts, meanwhile, can try their hand at the ski area’s only 1-kilometre black run. 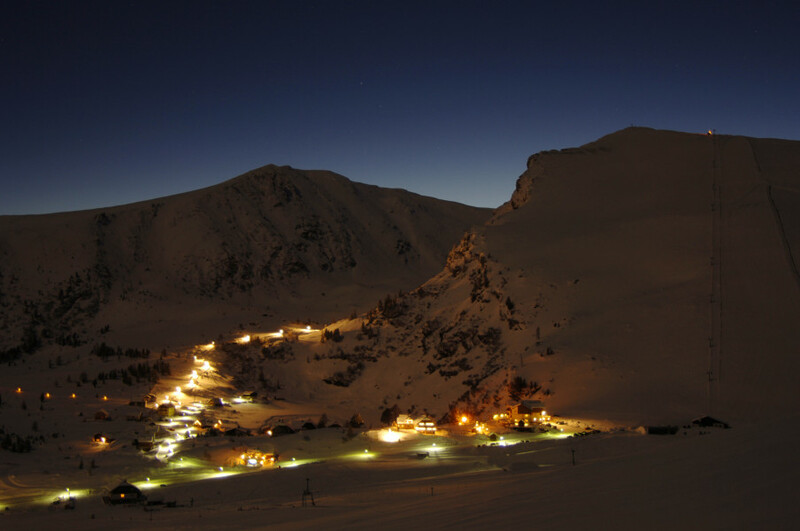 Seven lifts (four surface lifts and three magic carpet lifts) serve the mountain between the altitudes of 1,700 m and 2,300 m. The winter season 2015/16 saw the opening of the intermediate Alpe-Adria piste, which starts at the mountain station of the Spitzlift and runs for 1.4 kilometres down the mountain. 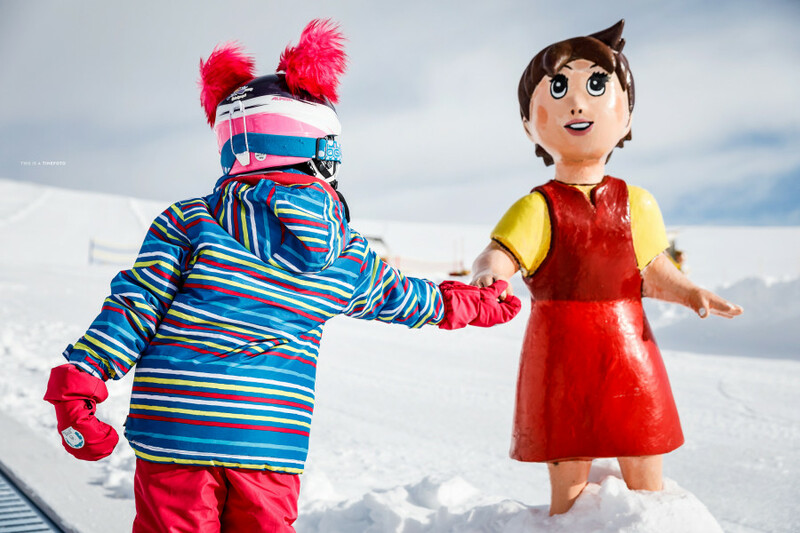 The Heidi Alm Skipark is extremely well-versed at hosting children. 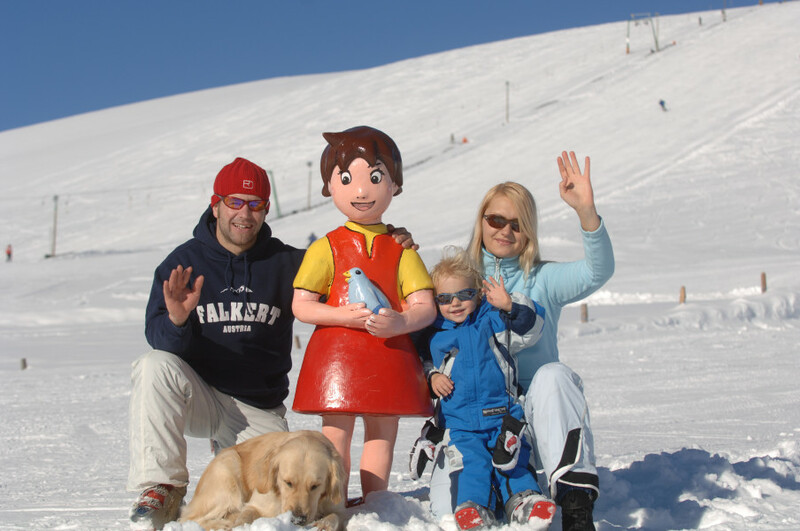 Here, youngsters can enjoy an unforgettable day or holiday on the mountain with their companions Heidi and Peter, the ski resort’s loveable mascots. Peter’s Schneeland should be the first port of call for kids – a safe nursery space where youngsters can make their first turns on two skis. Magic carpet lifts and professional ski instructors are on hand to help them on their way. Somewhat older kids should head for Heidi’s Kids Snowpark – an area with an array of different obstacles, including rails, boxes, rollers, a ski-cross course and a jump. On top of that, the budding ski racers of tomorrow can shoot down the permanent race course and hone their technique. Anyone who fancies a foray into the deep stuff can experience pristine powder in the compact but delightful freeride area, which is accessible from the Falkertspitz. 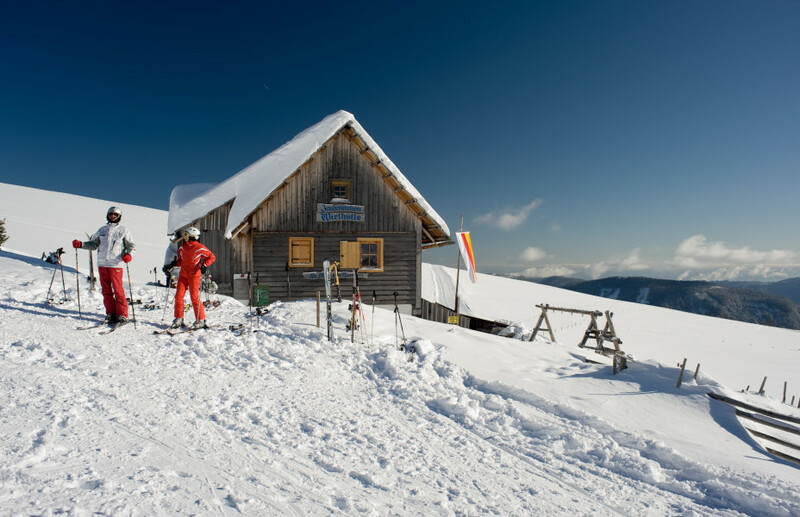 The Falkert is also the ideal starting point for ski tours in Carinthia’s Nock Mountains. 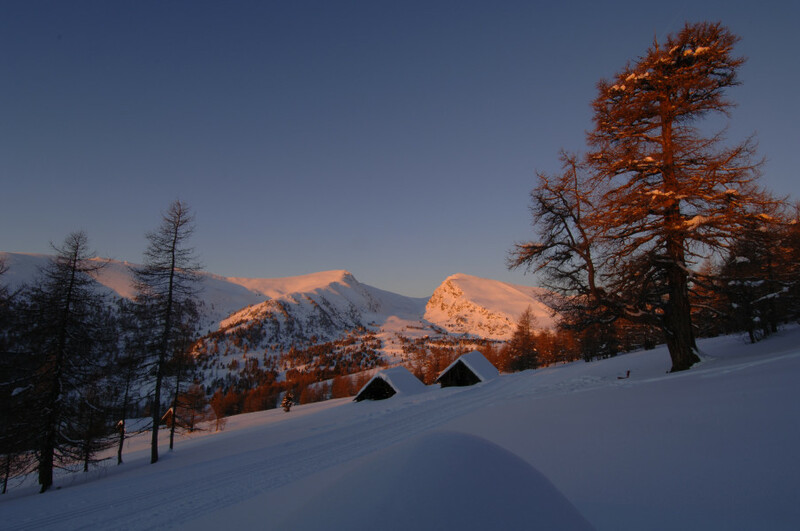 The mountain’s mellow crests offer unique ski touring terrain up to an altitude of 2,400 metres, with plenty of off-piste options available here, too. 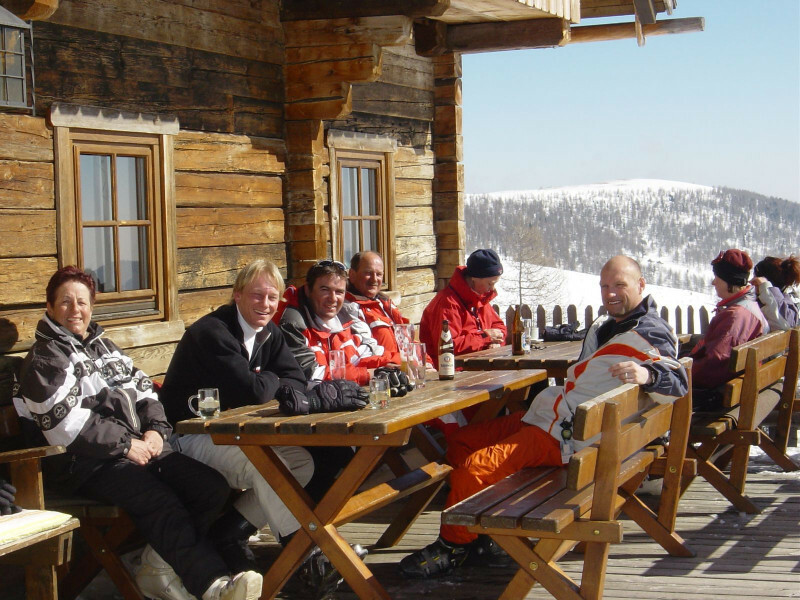 There is a range of welcoming mountain lodges and restaurants in Heidi Alm Skipark. The cosy Wirthütte is located directly by the Sonnenlift, and it’s known for its home-made culinary delights. Original Carinthian cuisine is also available in the Almstube by the lift car park. On top of that, the lodge plays host to legendary evenings featuring the Volte & Schilehrertrio every Thursday. The Zirbenhütte by the Zirmachlift is also a good spot for a relaxing break. This welcoming ski lodge boasts a tiled stove as well as a small open kitchen and delightful sundeck, serving guests hearty mountain fare and sweet treats. The cheese fondue available for groups in the evening comes highly recommended. In the cosy Jaga-Stüberl room of the restaurant at the Heidi-Hotel next to the Spitzlift, skiers can take their pick from an array of delicious specialities – everyone is sure to find the perfect dish for them. 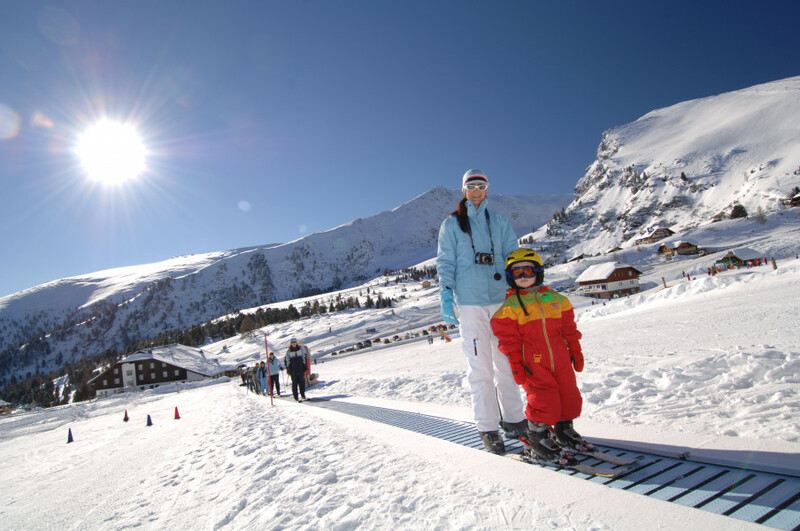 Familienrestaurant Schneekönig, which is geared up for families, is located just down from Heidi’s Skipark by the Sonnenlift. The menu includes both local specialities and international cuisine. While adults can soak up some rays on the sundeck, kids can let off some steam in the playroom or the outdoor play area. Although the Kärntnerhaus isn’t located directly next to the slopes, it is still well worth seeking out. The undoubted highlights here are the special themed evenings, which feature schnitzel and Carinthia-themed nights. 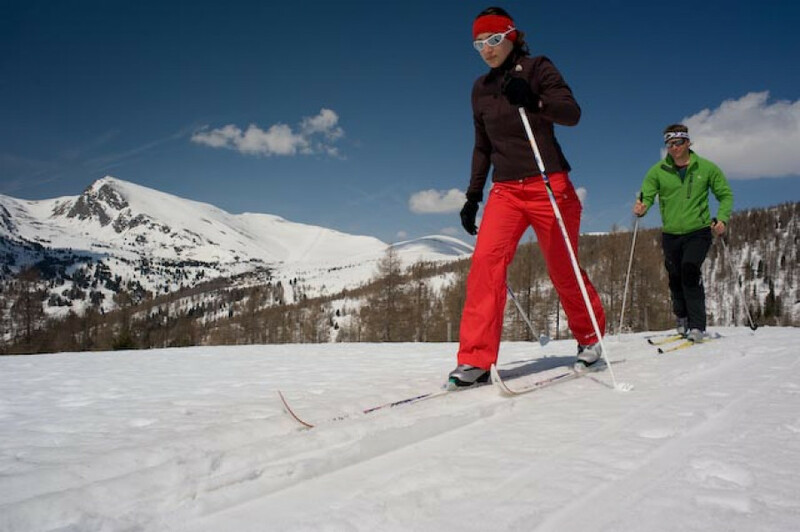 Away from the slopes, visitors can also enjoy some classic winter pursuits here. The frozen Falkertsee Lake is the perfect place for skating, curling and ice hockey, and if you want to satisfy that need for speed, visitors of all ages will enjoy the white-knuckle sled run by Falkertsee. Cross-country ski fans will also find a couple of trails to explore on Falkert – the “Höhenloipe” high-level trail which runs for over 6 km on Schweinsbichl, as well as the “Loipe am See” which runs for half a kilometre alongside the lake. Additional cross-country trails criss-cross the landscape further down the valley in Bad Kleinkirchheim. The “Höhenloipe” is also ideal for a gentle stroll through the winter landscape. And if you want to explore the backcountry of Nock Mountains National Park, there’s no better way than with a pair of snowshoes. The ski area on Falkert is a relatively quiet and relaxation-oriented ski area, which might leave après-ski fans somewhat disappointed. Only the legendary ski lodge evening events with the Volte & Schilehrertrio on a Thursday night in the Zirbenhütte offer anything in the way of après-ski atmosphere here. By car: From Salzburg it’s about 180 kilometres to Falkert. Follow the Tauern motorway (A10) until the Altenmarkt exit and then take the B99 (Tauernstraße) towards Graz. In Mauterndorf, turn onto the B95 and follow this road until you reach Vorwald. Take the turning off onto the L79, which leads directly to the ski area at Falkertsee. If you are travelling from the south and Villach, take the B98 to Unterweng and then merge onto the B88 via Bad Kirchheim to Patergassen. There, you should take the L79, which leads straight to the resort. 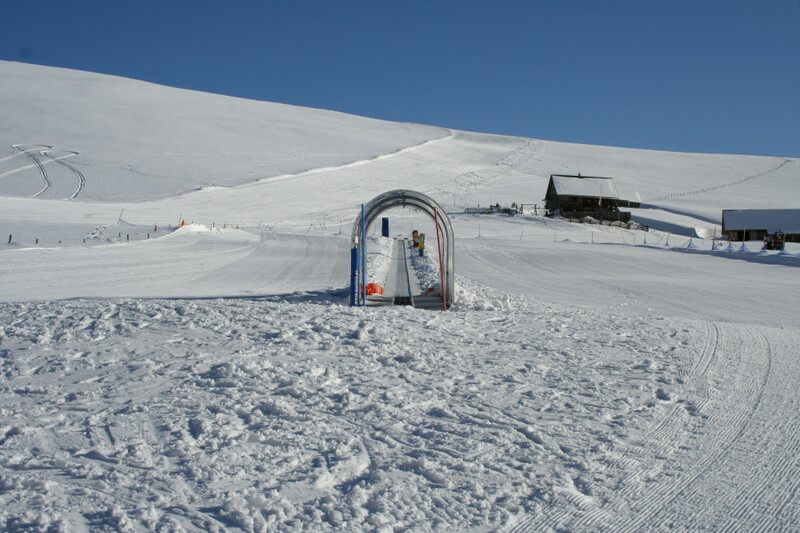 By public transport: The ski area is located in a very rural region and is therefore not particularly easy to reach by public transport. The nearest train station is in Spittal an der Drau, about 40 kilometres away, while the nearest airport is in Klagenfurt, some 50 kilometres from the ski resort.